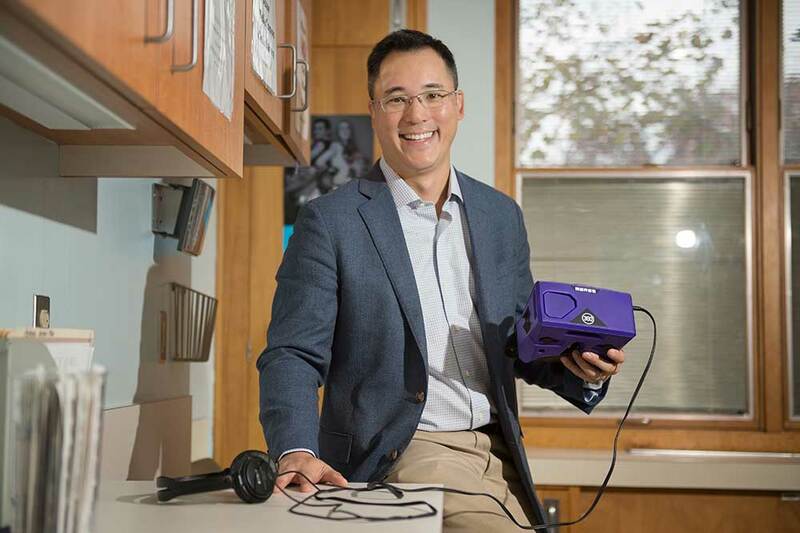 Dr. Jerry Lee shows the virtual reality goggles that he uses for some patients to distract them from medical procedures. Doctors at Penn State Health St. Joseph Downtown Pediatric Practice had a problem. A patient – a 13-year-old boy – was recently in need of immunizations. Doctors also wanted to draw blood, as the boy was taking psychiatric medications that call for routine monitoring. The problem was that the child, who had recently moved to Reading and was living with his grandmother, was suffering from the results of severe sexual and physical assault, explained Dr. Jerry Lee, a pediatrician at the Downtown Campus. Post-traumatic stress disorder and other conditions resulting from abuse made it extremely difficult for the patient to interact with doctors or allow anyone to touch him. After doctors had twice attempted to treat the boy with no success, Lee started thinking outside of the box. Even for patients without the types of problems from which the boy was suffering, procedures like getting shots or having blood drawn can be upsetting, Lee explained. That’s because patients tend to become hyper-aware of their surroundings and what is occurring, which can cause some distress. That distress was greatly multiplied in the case of the young patient with the history of abuse. With an idea in his mind and money donated by the Reading Elks Lodge, Lee purchased a set of virtual reality (VR) goggles. With a little research, he found an app that he could download onto his phone to give it VR capabilities. “I thought that if we could use the goggles to distract him, he might be relaxed enough to let us give him the shots and get the blood drawn,” he said.